The outcome of the Battle of Manzikert on that fateful day in August 1071 ushered in an element of chaos to the geo-political history of the Byzantine Empire. Although not the military disaster it was once thought to have been, the political consequences of Alp Arslan’s victory and the capture of Romanus IV far outweighed the actual losses in the battlefield. For modern historians, however, the real cause behind the disintegration of Byzantine power in Anatolia was the ambitions of the Norman renegade mercenary leader, Roussel de Bailleuil, who sought to profit from this instability and establish his own statelet in the north-eastern Anatolian Plateau. The key milestone for the future of central Anatolia were the two Imperial campaigns to subdue him, in 1073 and 1074. These campaigns, combined with the multiple civil wars of 1077–81, would eventually transform Byzantine politics in the region into a game of aligning Turkish interests from which the Byzantines would emerge as the great losers. The real challenge for the Empire in the aftermath of Manzikert lay in the mad scramble for power in Constantinople. With the Doukas family in the capital using the Varangian Guard to declare Romanus Diogenes deposed, the new regime -headed by the kaisar Ioannes and his sons Andronikos and Constantine – tonsured the Empress-regent Eudokia (c.1021-96) and proclaimed her son Michael as sole emperor. The Doukas’ next step was to dispatch an army under Constantine Doukas against Romanus Diogenes, when they learned that the latter had been released from Turkish captivity and was collecting taxes in north-eastern Anatolia. Romanus’ defeat in battle forced him to retreat to Cappadocia, and then to Cilicia, where he spent the winter of 1071/72 under the protection of the dux of Antioch. Yet another defeat in the following Spring compelled the former emperor to appeal for help to the Seljuks, while the government of the Doukas had, already, acquired the services of the Frankish mercenary leader Crispin and his followers. In the end, the lack of reinforcements and hope forced Romanus to surrender. He was cruelly blinded on 29 June, 1072. The socio-political unrest in Anatolia worsened with Roussel de Bailleuil’s attempt to create a realm for himself in Asia Minor. Frankish warriors from Italy first appear as individual mercenaries in the service of the Byzantine State as early as 1047, and Roussel de Bailleuil was, perhaps, the most (in)famous of them to have been employed by Constantinople. He was Roger Hauteville’s principal lieutenant in Sicily, who won the day for the Normans at the Battle of Cerami in June 1063. The next mention of Roussel comes in 1071 during Romanus IV’s fatal campaign that culminated at Manzikert, where Roussel’s contingent numbered around five hundred men. Then, he followed the ‘treacherous’, ‘greedy’ and ‘violent’ nature that characterized all Frankish and Norman warriors according to Anna Comnena, and he rebelled against his paymasters. The Frank sought an opportunity to break with the government in Constantinople when he was ordered to take part in an Imperial campaign to pacify Anatolia in 1073, which was led by Isaakios Comnenos (the future emperor Alexios’ elder brother). This expeditionary force included some 400 Frankish horsemen under Roussel who, under the pretext of protecting one of his men who had been mistreated by Byzantine officers, he split with the main body of the imperial forces in Ikonion. Isaakios was, eventually, defeated and captured by the Turks close to Kaisarea, prompting many modern historians to speculate what would have happened if the Byzantine commander could have had Roussel’s elite heavy cavalry unit at his disposal. What is certain, however, is that Isaakios’ army was the last Christian army that would march across Asia Minor to Kaisareia – in the heart of the Anatolian Plateau – until the coming of the First Crusade. What seems to have been far more disruptive for the Doukas regime was the severing of links between the capital and the towns and villages in the western and north-western Anatolian Plateau, where the mercenary leader was now collecting taxes and selling protection to the locals. An expedition was dispatched against Roussel in the Spring of 1074 under the kaisar Ioannes, who had also brought with him Varangian and Frankish units. But they were defeated at the famous Battle of the Zombou Bridge over the Sangarios river, with the imperial Franks deserting to Roussel before the battle. The Frankish captain then attempted something unimaginable: to take his troops – by now numbering some 3,000 in all – and march to Constantinople, in the vain hope that the people of the City would open the gates to him. His illusions were soon dashed, and he simply delighted himself in burning Scutàrion (modern Üsküdar), on the opposite Asian coast. Sometime in the end of 1074, Roussel even tried to create his own ‘puppet-emperor’ by proclaiming the captive kaisar Ioannes as the legitimate ruler of the Empire, in an attempt to provide political cover to his aggression. The growing power of Roussel’s forces caused the Doukas regime to seek a strong counter-weight, which at that time only the Turks could provide. Hence, the chief minister of the Imperial government took the fateful decision to hire a Turkish marauder in Bithynia, one Artuk (usually identified with Abu Sa’id Taj ad-Dawla Tutush, the younger brother of the Seljuk Sultan Malik Shah I). The Turks defeated Roussel’s forces at the Battle of Sophon (1074/75) by applying their typical steppe tactics of feigned flight while picking off the Franks with their arrows from a safe distance. Henceforth, the Byzantines would hire Franks to fight Turks and Turks to fight Franks. As Roussel resumed his operations in the Armeniakon theme, he carried on with his collection of taxes and the selling of protection to the locals. The Doukas regime now gave the task of capturing Roussel to Nicephorus Palaeologus who, in 1075, led a considerable force of Byzantine and Georgian troops around 6,000 strong against the Franks, but his men deserted him after he failed to pay them on time. Then, it was Alexios Comnenus’ time to appear in the political scene at the young age of twenty. The Comnenian writers magnify Alexios’ capture of Roussel, probably in 1076, but the actual events were less glamorous: Artuk had treacherously arrested Roussel and delivered him to Alexios at Amaseia, where the latter simply took him as prisoner back to the capital. Although it took about three years to suppress this uprising that had significantly undermined Imperial authority in large swathes of the Anatolian Plateau, this period marks the definitive loss of central Asia Minor to the Turks. The number of Seljuk and Turkoman bands arriving in the central Anatolian plateau increased dramatically after 1071-72, although there are no traces of permanent establishment in major towns but, rather, in rural areas where they formed profitable coalitions with members of the local aristocracy. 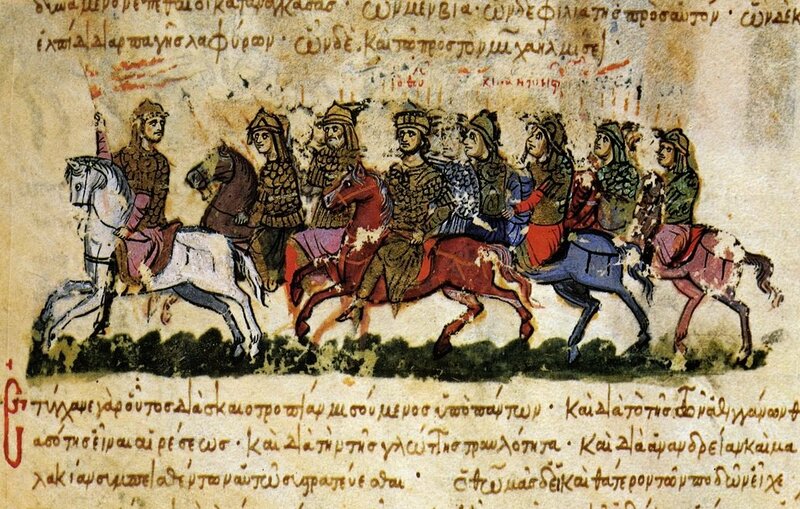 Isaakios Comnenus’ defeat and capture by the Turks close to Kaisarea, in 1073, followed by Alexios’ pursue of his brother’s captors in a north-westerly direction as far as Ankara, and the ambush – soon after Isaakios’ release – of the two Comnenoi brothers by a band of 200 Turks outside Nicomedia (less than 100 km east of Constantinople), clearly shows that the invaders had opened the way to Bithynia and the Marmara Sea through the south-western parts of the Anatolian plateau. Yet, between 1073 and 1076, it was Roussel’s Franks that posed a more immediate threat to the Doukas regime, especially in view of Roussel’s proclamation of kaisar Ioannes as ‘emperor’. The critical phase for the permanent establishment of Turkoman bands in western Asia Minor roughly coincides with the years between the revolt of the dux of Anatolikon Nicephorus Botaneiates, in June 1077, and the revolt of Alexios Comnenus, in April 1081. Undoubtedly, this is a period of massive Turkish involvement in Byzantine internal conflicts and power struggles, during which the Turks sought the opportunity to make money and gain privileges and land. Botaneiates’ revolt against the Doukas regime brought to the political forefront the sons of Qutlumush, the Seljukid Prince who had struggled unsuccessfully against his cousin Alp Arslan at the Battle of Damghan (1063) for the throne of the Great Seljuk Empire. Following Qutlumush’s death in 1064, his eldest son Suleiman fled with his three brothers into the Taurus Mountains in eastern Anatolia. Sadly, the sources provide little information about how Qutlumush’s sons reached Bithynia around the middle of the 1070s. Nevertheless, from the outset of Botaneiates’ revolt, it is clear that both Michael VII and Nicephorus were keen to employ the Turkish warriors roaming in north-western Asia Minor, and Suleiman b. Qutlumush and his men played a crucial role in these negotiations. According to Attaleiates, it was God’s providence that turned Suleiman to agree to an alliance with the rebel general, and it is likely that Botaneiates promised Suleiman a strategic town as a seat of his ever-extending power in the region: Nicaea. Suleiman’s Turks were also involved in the seditious movement of the dux of Dyrrachium Nicephorus Bryennius (the Elder), an important commander in Diogenes’ army at Manzikert, who – around the same time as Botaneiates – had risen against Michael VII having the support of the Byzantine army’s regiments in the Balkans. Bryennius continued his revolt even after Botaneiates was crowned Emperor in March 1078, and after failed negotiations, the young Alexios Comnenus was dispatched against him. Interestingly, Alexios sought a significant force of two thousand horse-archers from “the Turkish chieftains residing in Nicaea” (i.e Suleiman and, his brother, Mansour), to take part in an expedition that would culminate in the Battle of Kalavrye, by the Halmyros river in Thrace, where the rebel army was broken and Bryennius was captured. Two more revolts followed Kalavrye, and both of them were crushed by the up-and-coming Domesticus of the Scholae of the West, Alexios Comnenus. Another veteran of Manzikert, Nicephorus Basilakes brought up the armies of Dyrrachium and Bulgaria and some Franks from Italy, to Thessaloniki, only to be defeated by a cunning trick by Alexios. Two years later, in the autumn of 1080, Nicephorus Melissinos, another general who had remained loyal to Michael VII and had been exiled by Botaneiates to the Aegean island of Kos, decided to raise an army of Turks from western Asia Minor and march to Constantinople. Melissinos was married to Alexios’ elder sister Eudokia, hence the former’s refusal to face him in a pitched battle when ordered to by Botaneiates. Between the autumn of 1080 and the spring of 1081, Melissinos seized control of what remained of Byzantine Asia Minor with Turkish aid and proclaimed himself emperor. However, following the successful seizure of the throne by his brother-in-law Alexios Comnenus on 1 April 1081, he submitted to him, accepting the title of kaisar and the office of the governor of the second largest city of the Empire, Thessaloniki. Alexios Comnenus was now emperor, but the empire he ruled was one that had seen a massive decline over the previous decade. The Battle of Manzikert may have been a bitter defeat, but it was the response to it within Byzantium made their geo-political situation far worse. Fighting between Byzantine factions and the attempted power grab by the Norman mercenary Roussel would leave much on Anatolia in the hand of the Seljuk Turks. The Byzantine Empire, which had been the major power in the region only decades early, was now certainly on its knees. Georgios Theotokis: Ph.D History (2010, University of Glasgow), specializes in the military history of eastern Mediterranean in Late Antiquity and the Middle Ages. He has published numerous articles and books on the history of conflict and warfare in Europe and the Mediterranean in the Medieval and early Modern periods. His first book was on the Norman Campaigns in the Balkans 1081-1108 (2014), while his second on the Byzantine Military Tactics in Syria in the 10th century came out in October 2018. He has taught in Turkish and Greek Universities; he is currently a postdoctoral researcher at the Byzantine Studies Research Centre, Bosphorus University, Istanbul. Click here to read more from Georgios Theotokis.